So far, when discussing the concept of creative education always refers to the Western concept. Therefore, another approach is needed to discuss creative education. This paper offers the concept of creative education with an Islamic approach. In the Islamic perspective creative education deals with two concepts in Islam, namely the concept of bid'ah and ijtihad. Many debates that arise in the meaning of both, therefore this paper will try to explain descriptively the two approaches to develop students' creative thinking skills in the process. Some efforts that can be done by the teacher in the learning process: first, a teacher must be able to synergize the potential of students in the form of potential spirits, nafs, qalb and reason so as to be able to become a person who has the power "mujtahid"; second, the teacher must be able to provide a stimulus "ijtihadi" that can motivate the critical power of students by providing a stimulus and an opportunity to ask questions; third, the teacher must provide space and opportunity to "ijtihad" to students to explore every information and knowledge; fourth, teachers must be able to provide opportunities for students to think creatively in the sense that they are not always the same in conveying answers to each given problem by seeing a problem from a diverse perspective; and fifth, the teacher appreciates all student responses in a positive manner with the principle that the result of "ijtihad" if true gets two points and if it is not right gets one point. MUSLIH, Moh.. Pendekatan Bid’ah & Ijtihad dalam Pembelajaran: Upaya Mengoptimalkan Kemampuan Berpikir Kreatif Peserta Didik. Edukasia Islamika: Jurnal Pendidikan Islam, [S.l. ], v. 3, n. 2, p. 193-205, dec. 2018. ISSN 2548-5822. 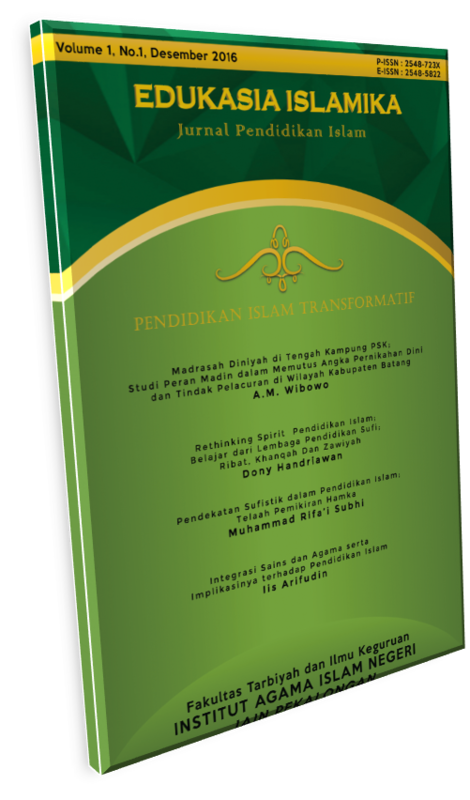 Available at: <http://e-journal.iainpekalongan.ac.id/index.php/edukasiaislamika/article/view/1599>. Date accessed: 21 apr. 2019. doi: https://doi.org/10.28918/jei.v3i2.1599.